What happens when a flutist, clarinetist, violinist, and cellist come together to play music? They commission composers, because preexisting works for this quartet of instruments are a rarity. And, gratifyingly, based on Monday night’s concert at Drinko Recital Hall — presented as part of Cleveland State University’s Cleveland Contemporary Players Artist in Residency Series — Hub New Music is building a fascinating repertoire and playing it beautifully. 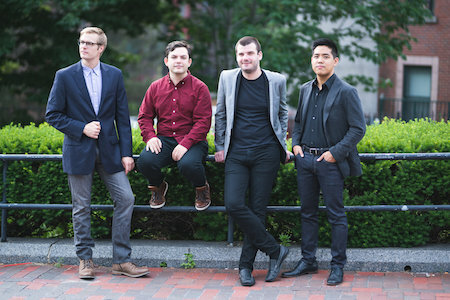 Next week, Boston-based quartet Hub New Music will make their Cleveland debut in two free concerts, highlighted by the premiere of Fun House by Andrew Rindfleisch, director of the composition department at Cleveland State. Flutist Michael Avitabile, clarinetist David Dziardziel, violinist Zenas Hsu, and cellist Jesse Christesen can be heard at CSU’s Drinko Recital Hall on Monday, March 26 at 8:00 pm, after a short residence working with the university’s composition department. Then they’ll head to Cirigliano Studio Theatre on Wednesday, March 28 at 7:30 pm to perform on LCCC’s Signature Series.